The weather was beautiful today (perfect temperature for a salad), and I am on a grain salad kick so I decided to make a curried brown rice basmati salad with raisins and cashews. It is simple to make and so good for you. With the turmeric and curry, it is perfect brain food for those of us studying for finals. Studies show that turmeric can enhance memory and, by the same mechanisms, helps to prevent against dementia. Turmeric is also known to relieve carpel tunnel syndrome, joint inflammation and pain. It is used around the world as a treatment for fever, mild stomach upset, infection, arthritis, jaundice and other liver problems, to kill infectious microbes and to improve heart health. Heat a large pot over medium-high heat. When hot, add 1 tablespoon of the olive oil and the rice. Quickly stir the rice until it is well-coated in the oil. Add the curry powder, turmeric, and bay leaves. Stir to mix the ingredients together completely. Add the water or broth and bring to a boil. When the rice reaches a boil, add the salt and lower the heat to a simmer. Simmer until done (about 15 minutes), transfer the rice to a large mixing bowl and set aside in the refrigerator to cool. When the rice has cooled, mix in the currants or raisins, chopped celery, red bell pepper and nuts. Whisk the remaining 1/4 cup of olive oil with the lime juice and pour over the rice. Mix thoroughly and enjoy. This colourful salad looks so delicious and it's healthy too! I wouldnt mind eating this though I seldom eat rice. Looks delish! I knew turmeric was anticancer, but not about it's other benefits, thanks for sharing the info. 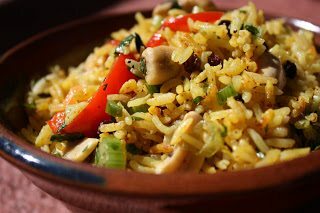 I love rice dishes – this looks wonderful! Oh, this curry rice sounds so addictive, Stacy! Who could ever resist this. Have a nice day! I've been trying to incorporate more turmeric into my diet. This looks like such a wonderful flavorful combination, love the medley of raisins and nuts. looks delicious! i love the addition of lime juice. what a delicious and colorful mix! This curried rice salad looks wonderful! Thanks for the post. Thanks for this curried rice salad recipe. Hope you did well on your finals. Good post. Curried Rice Salad looks like a great dish to enjoy. Thank you for providing the recipe. Our diet must include all the vital nutrients like carbohydrate, protein, fat, vitamins, minerals and water in proportionate amount. A balance diet refers to the intake of appropriate and adequate amount of foods and drinks that supply nutrient and energy to the body for maintenance of body cells, tissues and organs that support the normal growth and development of the body. Nutty, yellow rice – with health benefits too. It sounds like a dish right up my alley.